The desire to save a few bucks with regard to maintenance and energy bills would definitely tempt you to go for installation of a vinyl replacement window in Chicago. This has now become a favorite option of home owners who are searching for replacement windows especially for those made of wood. The decision to do vinyl replacement windows installation on your own should not create any difficulty. It just needs some easy-to-acquire tools and an idea of how to do it properly. The Internet abounds in detailed and step by step guidance on how to do it. The following are some brief guidelines which would be of assistance to you. This is a step which deserves utmost attention. Vinyl replacement windows are made in accordance with the measurements you give to the manufacturer. This means that you have provide the opening dimensions as perfectly as possible. Checking with the manufacturer of your choice for the measurements would make sure that you are not making any mistake in this field. Done this, you can go on to the next step of a vinyl replacement windows installation. To begin with, remove the old window from the opening which process may vary greatly depending on the material and type of installation used previously. 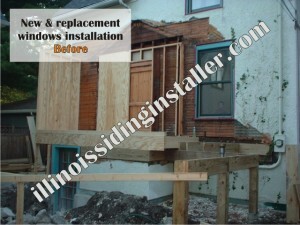 In some cases you might be required to assemble a new frame for the new vinyl window installation procedure. The next step in the vinyl replacement windows installation is fitting it into the frame. It would be great if it is done with the help of a pair of second hands. Trying to lift the window and making sure the stops are properly fitted may appear to be a bit difficult if you try to do it single-handedly. If the measurements are correct, the window would sit tight by the outside stops. After making sure that the window is fitted perfectly, tighten it gently with the required number of screws into the holes which are preset by the manufacturer (usually top and bottom on both sides). Do not over-tighten the screws to prevent possibility of window deformation! After that open and close the installed replacement window repeatedly to make sure that everything is operating perfectly. Making use of some fiberglass insulation or low expansion foam to fill any gaps along the frame and a caulking gun to run a few lines outside the window would help protecting from drafts. 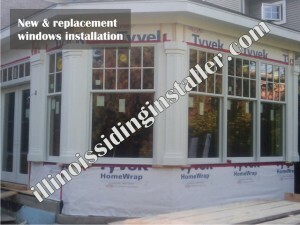 The reasons for the popularity of vinyl windows replacement installation are numerous. And, the prominent among them are energy efficiency and ease of cleaning. Just wiping the windows with a soft detergent at regular intervals would suffice to keep it fresh and clean all the time. Vinyl windows are made from PVC. 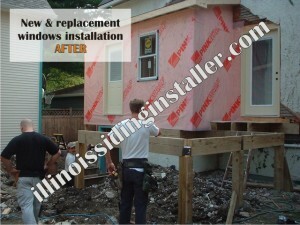 Furthermore, vinyl replacement windows installation in Chicago is budget-friendly. Even if you take professional assistance to install the window, the total expenditure would come up to only half of the costly wooden windows. And, the decision to install it on your own would add up to the savings you make from the replacement. What to look for in a vinyl replacement windows installation? If you wish to get the maximum out of vinyl windows replacement installation, you should make sure that your choice is a well-considered one. Go for those windows with the energy-star rating. Energy star rating is a certification given for manufacturers who follow the guidelines of the Environmental Protection Agency (EPA), United States with regard to energy efficiency. The frames can be of any material. However, frames made of wood or vinyl are highly recommended since they offer greater insulation. Besides, the features like inert-gas insulation and multiple glazing ensure that the heat does not go outside during winter and the cool conditioned air during summer. Even if the selection is done with utmost care, you may fail to get the desired benefits if the vinyl replacement windows installation is not done properly. Research well before making a final commitment with the contractor of your choice. 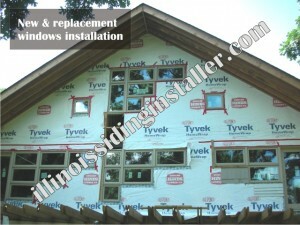 Weather you follow these basic guideline, do some more research, or contact us for help, replacement vinyl window installation Chicago should save you significantly on utility bills and maintenance cost.